FILE - Democratic presidential candidate Hillary Rodham Clinton, left, and her daughter, Chelsea, attend the Foundry United Methodist Church for their Bicentennial Homecoming Celebration, in Washington, Sept. 13, 2015. Despite a big fundraising advantage and a slew of endorsements from party leaders, Hillary Clinton's standing with voters has slipped. 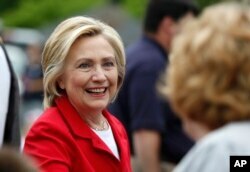 Multiple polls show a majority of Americans don't find her honest and trustworthy. Chelsea Clinton was asked about those polls on NBC's "Today'' show. FILE - Democratic presidential candidate Hillary Rodham Clinton greets a spectator at a Fourth of July parade, July 4, 2015, in Gorham, N.H.
Chelsea Clinton was interviewed on "Today'' about her new book, "It's Your World: Get Informed, Get Inspired & Get Going!'' Her book is an illustrated guide for young people looking to become involved in political and social causes. 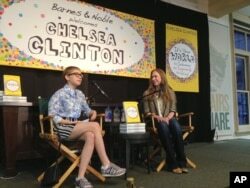 Later Tuesday, she appeared before 200 people at a Barnes & Noble store in New York, the beginning of a 20-city tour. She never referred directly to the upcoming presidential election, but she did mention voter registration as a priority and stated a couple of times that the people in public office made a difference in everyday life. But otherwise, like so many authors with books to promote, she spoke almost exclusively about her work. Chelsea Clinton, right, speaks with teen actress, author and magazine publisher Tavi Gevinson on Sept. 15, 2015, in New York. "It's Your World'' is off to a solid start, ranking No. 54 on Amazon.com's best-seller list as of late Tuesday despite a negative review in The New York Times and criticism in The Washington Post that the 402-page book could give kids back problems. The 35-year-old Clinton, interviewed by teen actress, author and magazine publisher Tavi Gevinson, cited a book published during her childhood, "50 Simple Things Kids Can Do to Save the Earth,'' as a model for her own publication. She described herself as an engaged and conscientious girl who would "obsessively'' cut up the plastic rings that held soda 6-packs together because she had read that marine wildlife choked on them. Clinton also remembered listening to National Public Radio with her mother while growing up and praised her mother and her father, Bill Clinton, for pushing her to have opinions and the facts to support them. "That was a tremendous gift that they gave me,'' she said. She answered a handful of audience questions. One person wanted to know if she might run for office. "I've been asked that question for as long as I can remember,'' she said to audience laughter, adding that the book and her work with the Clinton Foundation were her priorities for the moment. No one asked her about her mother's Democratic presidential campaign.